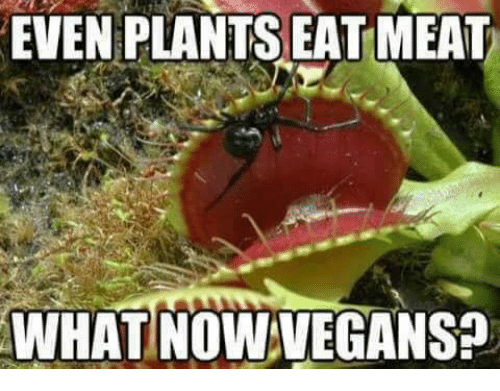 Over a year, and we get inundated with vegans who have that disgusting holier than thou attitude all the time, saying they don't want to kill anything, yet most eat plants with no concern for the plant life or feelings. They think that all they have to do to be green is be vegan, instead of getting off their dead asses and building Earthship greenhouses with the love and understanding of soil and plant life. They tend to have too many kids quite often and excusing it with being vegan is less impact. Sure a little, but not 50%. Then one kid ruins the footprint. And they can communicate with other plants too! As for the whole "this discredits veganism" argument, not sure it holds up... Plants still don't have a central nervous system that can sense "pain" in the same way a pig or cow does. If your goal is to reduce suffering then eating plants is still your best bet.